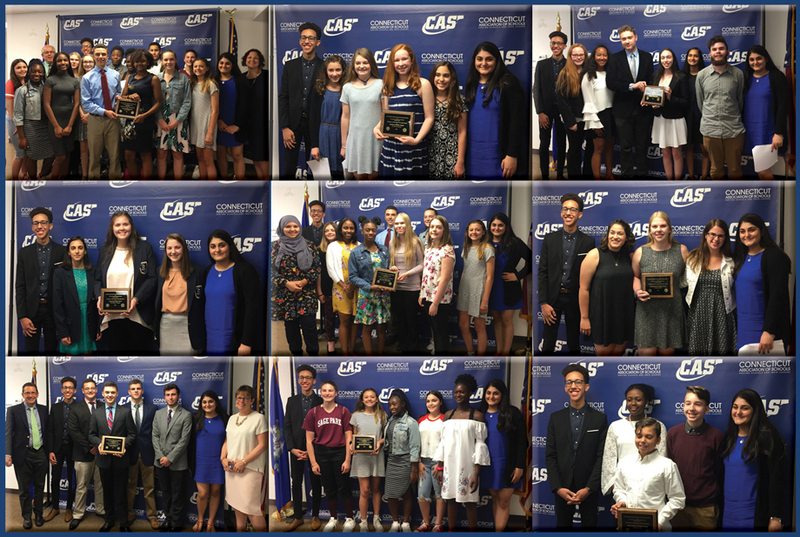 On May 23rd, students, advisors and principals from around the state filled the CAS conference room for the presentation of the 2018 Challenge to Educational Citizenship Awards. Representatives from the six winning schools were in attendance to share and showcase their extraordinary community service initiatives. The Challenge to Educational Citizenship Awards Program began in 1996 and is the brainchild of the State Student Advisory Council on Education (SSACE). Projects submitted for consideration must demonstrate good citizenship, civic awareness and leadership and must provide opportunities for students to help others. Guest speaker Dr. Sarah Barzee, Chief Talent Officer, spoke about the importance of kindness, a message that was echoed by student emcees Ananya Kachru from Amity High School and Argenis Herrera from Waterbury Career Academy High School. SSACE members Isha Dalal from Trumbull High School, Tyler Deitelbaum from Naugatuck High School, and Audrey Garcia from Bethel High School presented plaques to each of this year’s Challenge Award recipients. Below is a brief description of each of the inspiring programs selected for recognition this year. Or, click here to download a ceremony brochure. Friends of Rachel is a national organization in memory of Rachel Scott, who was killed at Columbine High School. The mission is to promote a safe and positive school environment. The Community Club has a total of eight students and two faculty advisors and was started this school year. The focus of the club is to support a local homeless shelter and soup kitchen. The center is the Friendship Service Center in New Britain, CT.
For the Love of Paws helps all the poor animals without homes at local shelters. This year we collected 4 large boxes of our handmade blankets, treats, toys and cleaning supplies. Every year Madison’s Service Club Kare works together to organize gifts for children at the Center for Family Justice. We make fleece tied blankets and add pjs and a stuffed animal for holiday gifts. Madison Middle School students earn ROAR tickets through an awards program. This year KARE Service Club made contributions which allowed kids to have fun at lunch during the spring. This allows kids to celebrate and encourage students to be Responsible, take Ownership, have a wonderful Attitude, be Respectful, and be Safe. Best Buddies is a program at Naugatuck High School that helps to create friendships, integrated employment, and leadership development for people with intellectual and developmental disabilities. Naugatuck Youth Leaders is a community service collaboration program between Naugatuck High School and Naugatuck Youth Services. The initiative taken successfully increased kindness in the schools and community while empowering other schools to create their own projects with the same goal. Notre Dame High School Interact Club Successfully completed its second Harvest Pack Project. This included the participation of more than 200 student, adult, Rotarian, and faculty volunteers packaging over 55,000 meals for recovering families in Haiti. Second annual basketball shooting contest where all the proceeds went to the Leukemia & Lymphoma Society (LLS). Hoping that our contributions will eventually lead to a cure, which would positively impact millions. Members of the 7th Grade Sage Park Leaders wanted to be a positive voice for change in the 7th Grade and the Sage Park community. As student leaders, they were asked “how do we make the school better?” The student leaders came up with the rest. They planned, prepared, and presented a Day of Compassion assembly to the entire 7th grade. Sage Park Leaders currently serves 108 members who meet with advisors twice a month. Its mission is to improve the leadership qualities of its members, while fostering positive peer relationships to help create an emotionally safe school. Sage Park students give back to the community by visiting Seabury Nursing Home on a monthly basis. This community service trip provides approximately 20 students to give back to our community every month. Sage Park Middle School has been visiting Seabury Nursing Home for over 10 years. Women’s leadership group assists local females in the area. This group of twelve eighth grade females, assembled six fleece blankets for the YWCA in Hartford, CT. The YWCA works to extinguish racist beliefs, strengthen women, and advocates for peace, justice, freedom and dignity.